Preheat oven to 425°. 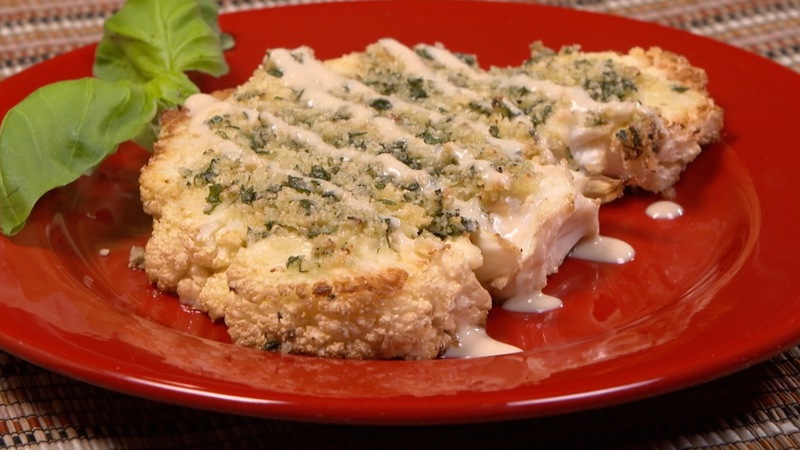 Place cauliflower steaks on baking pan and spray with olive oil cooking spray. Sprinkle with salt and black pepper. Roast until tender and browned, about 30 minutes. Set aside to cool. While cauliflower is roasting, place dressing ingredients in a small blender in the order listed, blend and set aside. Then, whisk mayonnaise and mustard in a small bowl and set aside. In a medium bowl, combine olive oil, garlic, basil, salt, pepper, panko and Parmesan and set aside. Once cauliflower is cool enough to handle, spread each steak with the dijon/mayonnaise mixture and pat about 1/4 C of the basil bread crumb mixture onto the steaks, coating both sides. Return to oven until panko is browned, about 10 minutes or so. To serve, drizzle steaks with some of the Tahini dressing and garnish with basil leaves. Serve additional dressing on the side. Calories 295, Protein 12g, Carbohydrate 25g, Fiber 6g, Fat 16g, Cholesterol 0.0mg, Calcium 168 mg, Sodium 793 mg.
Calories 68, Protein 1g, Carbohydrate 4g, Fiber 0g, Fat 6g, Cholesterol 0.0mg, Calcium 11mg, Sodium 114 mg.